VOL. I NO. 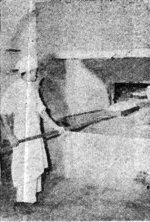 17 DELHI, THURSDAY JANUARY 7, 1943. RECOGNIZE HER? Dorothy Lamour's Hollywood press agent wants all of you guys to know that this hair-do was created for her latest picture. Most important, though, is the fact that the war has not prevented Dottie from wearing a sarong. Out here flying "The Hump" has usually been considered a rather tricky operation requiring skill, daring and a thorough knowledge of the technique of flying an airplane. The National Aeronautics Council, however, appears to have other ideas. "This is your last chance before your name is dropped from our preferred list." The organization then came through with some "easy lessons" on how to execute Junior Chandelles, Lazy Eights, and night landings. "The recipient of your letter is offering sum total Rs. 2 for personal instruction in 'How To Fly The Hump.' However, the receiver of this famous offer has flown the storm-ridden Himalayas for a considerable time. We are all anxious to learn of your thrilling and new advance instructions, including night landings. Please send all instructions, including night landings, to the boys of 'Hump-Happy Tavern.'" Tenth Air Force planes this week again found selected targets in Burma and showered them with their customary attention. The Christmas week more-blessed-to-give touch lingered to obsess our boys on six different days, and the ungracious Jap did little more than to show his oversized teeth. Heavy bombers on December 29, attacked Jap shipping at Rangoon. The first flight discovered a tanker of about 5,000 tons heading from Moulmein toward Rangoon, and left it in flames. The second flight bombed an enemy freighter which was heading east near the mouth of the Rangoon River. A direct hit was scored on this 5,000 to 6,000-ton vessel, causing a violent secondary explosion and bringing the ship to a complete stop. On December 30, medium bombers attacked the air base at Shwebo. hangars and revetments were hit and a large oil fire started. On December 31, fighter planes, armed with small bombs, attacked railway communications in northern Burma. 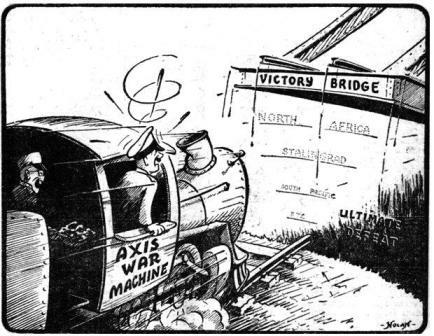 Rolling stock and installations at Naba were targets for direct hits. Near Mohnyin a train of six cars was strafed and the locomotive destroyed. Mawlu, Hopin and Pinbaw also felt similar treatment. New year's day, medium bombers attacked the important railroad bridge at Myiting, south of Mandalay. Hits were reported on various sections of the structure. On January 2, medium bombers made seven direct hits on Monywa air base. A bomber offensive was carried out January 4, against railroad installations at Naba Junction, where a high percentage of hits were claimed among a concentration of rolling stock. A large formation of heavy bombers attacked the railroad yards at Mandalay on the same day. All bombs hit a great concentration of rolling stock. Smoke columns from fires started could be seen 70 miles away. CHRISTMAS - IT WAS GRAND! The little boy doesn't quite know what to make of the bag of candy and fruit being presented to him by Maj. Earl H. A. Isensee and Lt. Salvata J. Veneziano at one of our advanced air bases. The child's father, a bearer with the organization, holds him and smiles proudly. 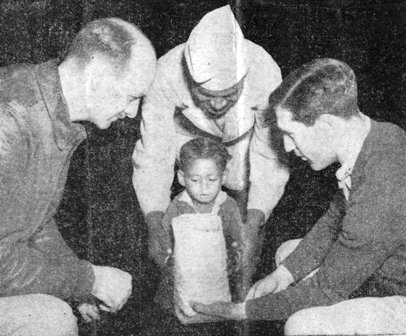 Throughout India American soldiers threw Christmas parties for poor and indigent children. This very fine picture was shot by Corp. Marshall Wickey. 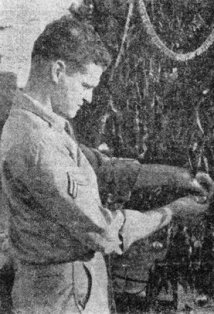 Maj. Paul C. Droz, commander of a U.S. fighter squadron in Assam, celebrated New Year's Day by making another daring rescue of a forced-down American pilot. With the same preliminary trainee plane with which he lifted Lieut. Cecil Williams and Corp. Matthew Campanella from a remote jungle village several weeks ago, Droz this time brought back Lieut. Willard A. Wendt, who was forced to parachute out of his P-40 in the fighter raids against Japanese railway communications on Dec. 31, which was also Wendt's 23rd birthday. Squadron mates noted the point - near Japanese-occupied territory - where Wendt landed, and dropped food to him. It was too dark to attempt rescue the same day, but bright and early on New Year's morning, Droz warmed up the engine of his little biplane and stepped in with a Tommy gun and other essentials that might have come in handy. Protected by a top cover of fighters, Droz sailed without incident right to the spot where Wendt made his landing. The forced-down pilot had already surveyed the ground in the area and from his parachute fashioned a tee to indicate the best landing place, a 300-foot sandy stretch along a river. The lonesome, but uninjured Lieutenant scrambled joyfully into the Major's plane for the ride back to his own field. The CBI Roundup campaign for funds in behalf of the Bengal Cyclone sufferers is hereby officially closed, even though one lead-fannyed SOS outfit has advised that they will complete their collection on January 10th. We'll bet this is the gang that howls the loudest when the Roundup distribution is late by one day. Send your check direct to the Indian Red Cross boys, you can't ride on this bus. The total therefore stands at Rupees 4,736 annas 11. Dr. Puri of the Indian Red Cross is most appreciative of this voluntary gift, which has accomplished much good and compares favorably with collections by other agencies for the aid of the distressed in the cyclone area. The CBI Roundup bows to all who tossed rupees into the hat. It was a good cause and, considering that we made no major effort to jerk tears of hit G.I. 's over the head to make them kick in, it was a satisfactory response. At right is the recap on who gave what as it's down in the record. 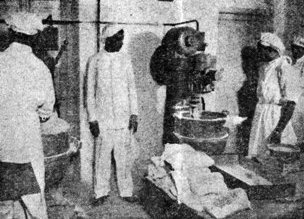 Here's how a new U.S. Army bakery is turning out bread in mass production for the fellows at an Indian seaport base. Left: Modern mixing machines are included in the equipment. Center: Newly-baked loaves come out of the oven. Right: T/Sgt. 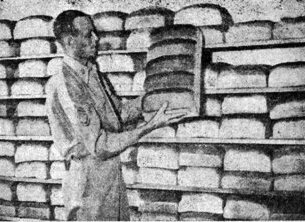 James E. Wiley, who is an old hand at running Army bakeries, looks over some of the finished product. (Photos by T/5 F. A. Garlick). December 24th, in addition to being the day before Christmas, held additional pleasure for seven members of the Fighter Command when they were the happy recipients of awards for heroism and gallantry in action. The awards were made by Brig. Gen. C. L. Chennault, Commanding General of the China Air Task Force. The first to receive an award was Colonel Robert L. Scott, Jr., upon whom the General pinned the DFC for his brilliant success in directing his fighter element in dispersing a superior number of enemy forces, thereby permitting the successful completion of a bombing mission. In this encounter the Colonel shot down two enemy planes and probably destroyed two more. (The Colonel now has 13 confirmed planes to his credit with five more listed as probables). Next came lt. Col. Clinton D. Vincent, who received the Silver Star for his extraordinary performance soon after his arrival in China. Captain Burrall Barnum stood next in line and he also was awarded the DFC for his superior efforts of September 6, 1942, when, alone, he was able to prevent great waves of enemy planes from completing their mission. Captain Jeffrey O. Wellborn was then awarded the Silver Star for his single-handed strafing and bombing attacks on enemy installations along the Salween River. Lieut. Dallas E. Clinger got the DFC for his heroic attacks on an enemy bombing formation of 23 planes on July 31, 1942. In this attack, Lieut. Clinger flew with such daring and skill that he prevented the destruction of his flight leader and accounted for at least one enemy plane. M/Sgt. John W. Brewer received the Silver Star for bravery and devotion to duty on August 5, 1942, when he manned a ground gun during an attack on the airdrome. During the attack Sgt. Brewer stayed at his post despite the fact that enemy fire was falling all about him and was able to bring down one of the attackers. 1st/Sgt. Thomas L. Irwin was the last member of the Fighter Command to be decorated when he was given the Purple Heart for his gallant action during a bombing attack. Two of our protecting fighters were damaged during the attack and it was necessary for them to come in for a landing, but the Chinese coolies who normally placed the lights for night landings had taken cover. Sgt. Irwin calmly set about this task with bombs falling all around and thereby enable the damaged planes to land safely. 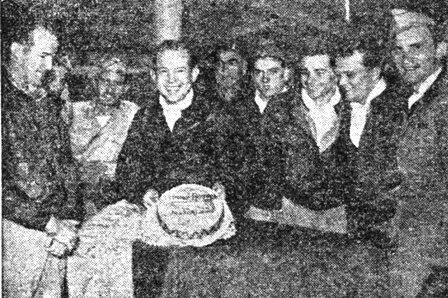 CAKE-EATERS Ready to eat his birthday cake, Major John Allison is surrounded by flying pals in the operations room at a China air base, shortly after a Jap bombing attack there. Left to tight: Capt. Hampshire, Lt. Griffin, Lt. Detchmendy, Maj. Allison, Lt. Bridenbaugh, Lt. Briant, Lt. Best, Lt. Barnes, Capt. Goss. Christmas in Assam had a dry and drear face as the momentous occasion approached, but G.I. ingenuity overcame the Saharan prospects in the department of Yuletide cheer (bottled). The wailings of the thirsty subsided into light whines and jeers when artificers such as Corp. Norbert J. "Little Bear" Taylor discovered "Saki," bamboo juice, extract of coconut, and a couple of other gruesome brews distilled by the Schenley family's Indian cousins. With one shot producing a glow like a Roman candle and two bringing utter collapse, a little of the stuff went a long way. Foremost victim of over-celebration was Pvt. George Spears who one minute was sitting beside a campfire in the hills feeling all warm and Christmassy and the next was being rolled up like an old rug, tossed into a jeep and hauled off to "St. James' Infirmary" where he lay as one dead for some time before coming around. Those knowing the right alleys to enter and doors to knock on could obtain small quantities of more well-known liquors by the simple expedient of parting with their eyeballs, but the mass of doggies opined, "C'est l' guerre" and were content with their ration of a jigger of rum, served just ahead of a holiday feed that easily filled the bill. S/Sgt. Milton Markus spent the period playing Santa Claus, frantically plowing through mountains of packages and getting same all stuffed in the proper stockings, which, after the beefing he has endured in common with all mail orderlies, rates a stout "Hurrah." There was even a Christmas Tree, complete with trimmings, beneath which, before a goodly throng Thursday afternoon, the countless younger pensioners of the local tea estate were presented with candy and goodies in a pretty swell gesture of the right spirit. The faces of young India were good to see as they filed shyly past Chaplain (Capt.) Ernest Isreal to get their welcome "baksheesh." Watching, a lot of the boys decided Christmas was not what you get in a bunch of boxes or pour out of a bottle, but a feeling inside that everybody's your buddy and it's good to be alive. For them, war and Assam notwithstanding, the holidays were still "the gladdest time of the year." Our target was, well, so and so. Left "Death" and "Destruction" below. And the people we played Santa Claus to. You guessed it my friend, they were Japs. Or the coals of flameless camp fires. Fly down from the mountains to bed. With tea baskets upon each head. A low familiar drone appear. To welcome home her tin-cow dears. And twilight fades to long night's rest. And guide him by thy will. And peace and comfort find. His be the victor's song! Of Stronger love than mine! Mine - This humble prayer! BUZZ BUZZ - Lt. Holmes almost went deaf from the din of the bell; Sgt. Bill Fleming ran himself ragged trying to dodge the flying sparks; and Top Kick Desire D'Orange was pretty darn close to electrocution. It all happened when M/Sgt. D'Orange short-circuited a wire while trying to install one of those new-fangled American contraptions, a buzzer system, in the Orderly Room of our little Indian Paradise. Capt. Caughman saved the day - and the buzzer system - with a few deft manipulations. "Listen boy, that's real shooting. Anybody can hit a full-grown deer. It's the little one's that are tough." PALPITATING PETTIGREW - Last week we wrote of a lieutenant who slapped a soldier on the back. This week a similar incident occurred. Pfc. "Cy" Pettigrew hadn't seen his friend, Sam Levenson, since both were in the hospital and when they met on Queensway "Petty" tossed his arm around Levenson and gabbed for about two minutes before he noticed the gold on Lt. Levenson's collar. Chirped Pettigrew: "Eek... SIR!" PROMOTION, SAHIB - Pfc. Frank Lawson was getting the old Fortune-Telling spiel the other day. He was told that he had "friends on lips but not in heart" but that pretty soon he would have a promotion. "Where," asked Frank, "Here?" as he pointed to his arm. "No" stated the F.T. "On shoulder." "M-1?" quizzed Frank further. "No" repeated the F.T., "M-2" (An M-1, Fortune Teller Wallah, is a Garand Rifle). There Was Inspection - Period! The fire at the U.S. Army Hospital last week is hereby reported "Put out." It burned the roof off one of our new wards. Other wards were saved by quick-thinking Yanks who pulled down Indian labor and supply huts which also were on fire. The cause and damage of the fire is to remain a military secret, the censor states. Casualties? No and yes. No patients were injured, but two members of the staff suffered "third degree" fractures. Sgt. Caldera broke his arm somewhere between the bucket and the fire. Captain Woodward, our supply officer, believing in fighting fire up close, had to dodge a section of burning roof. He stepped in a hole and broke his foot. The captain is not inactive tho! The supplies must go thru. As this goes to press, the damage done by the fire is about repaired and your hospital is still ready for action. Babies - so that's what is making Lt. Jones so low lately. I just heard that he bought all the cigars the P.X. had, and was saving a "bottle," so I asked Capt. Riley for the official data. He said that it was all on the level and that the name selected was "Washington Roosevelt Joes." All he lacks is that important news. Our C.O., Major Miles, was away from the hospital for several days last week. Capt. Bickel, figuring that there would be no inspection, shaved at the hospital instead of using the outdoor system (cold). There was inspection period. Sgt. Kinnee just told me that Pfc. F. S. Hogan has been christened "Sabs" (to be continued). What we wonder is who started the joke about "Pop" Pasqualee and the Vincent's? Hm. Christmas candy. Then there's Sgt. Major Vest's 30 pounds of Christmas candy that he ordered. Sgt. Vest had all his teeth removed this week. No reflections, but when "Porthole" Pennington came rushing in the other day, we thought he must have seen a ghost or a white girl. - All he could say was "Gee, that 42 sedan drives nice." P.S. We found out he did have two white girls with him. Maybe this weather is getting him, no? There's that one about Kizarr but it's censored. Do something else, Sergeant. Our mess officer, Lt. McLelland, made a sign for the Indian help under his direction. The sign was "HATH DHOYO," and means "wash your hands." Hm, now the Indians can't read. If they could read, they would read Hindustani characters. Socially speaking: Captain Woodward and Sgt. Gordon spent last weekend "somewhere" in India. The Captain was wearing his foot in a cast at the time. Sgt. Gordon didn't say what he was wearing. In an interview, they stated that they danced, played tennis and English snooker. Capt. Woodward must have a pretty strong pull, for he returned with a pair of elephant tusks! An elaborate Christmas party was given for the personnel of the 95th Station Hospital on Wednesday night, December 23. Sgt. Caldera taught Miss Sonny LeGlaire to "jitter-bug." Sonny was responsible for obtaining the refreshments and the feminine pulchritude. Miss Jane Easton, Army nurse, returned to duty this week after spending several days in Calcutta. 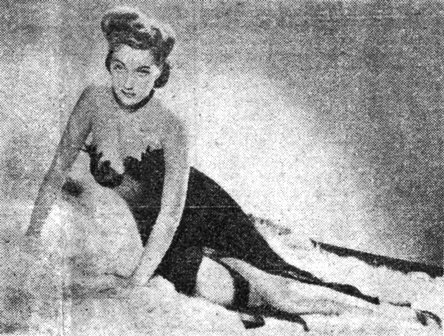 Miss Easton, when interviewed, stated that she had an enjoyable time and that they are all out of Christmas "spirit" in Calcutta. She was also present during the city's first night bombing raid. Upon being asked if she was afraid, she replied that it was dark and that she was well protected by "Golden Leaves." 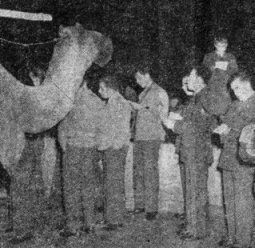 A camel created real Christmas atmosphere as men sang carols in a central India city. 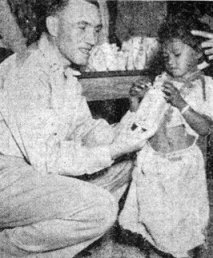 Center: Chaplain Ernest A. Isreal passes out a bag of candy and fruit to one of the servants' children, who were entertained at a base in Assam. 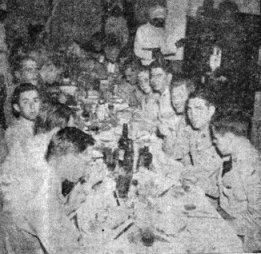 Right: Christmas dinner for men of an air base in an Indian port city. 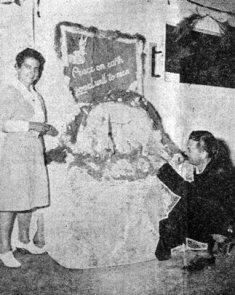 Corp. James Cronin puts final touches on the Christmas decorations he made for the base hospital at an Indian port city, as Miss Jeanette Ross, of the Red Cross watches. Center: Corp. Benjamin W. Nevitt decorates a tree up in Assam. 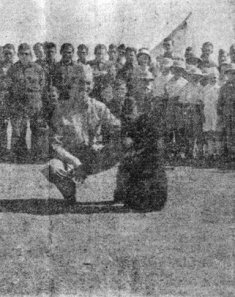 Right: "Vic," the bear, and 1st Sgt. Gerald Calkins entertain Polish refugee children who were guests at an Indian seaport city. "I come from a long line of soup drinkers." 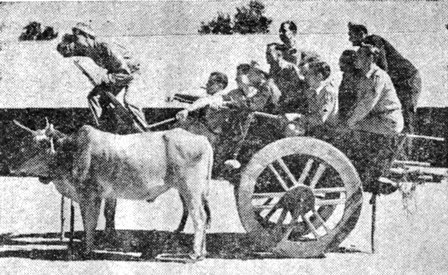 JAP HUNTERS Non-commissioned instructors at the Chinese-American Training Center set out by bullock cart to try and hunt out some Japs. 1. Soup as presently served consists of a grayish, viscous liquid unstimulating to sight, indifferent as to taste and smell and deficient as to nutritive qualities. 2. On rare occasions the above has been replaced by a vegetable soup of adequate consistency and nutritive value composed of fresh ingredients readily available and locally procurable through purchase in the open market. Past production of this soup has likewise conclusively demonstrated the skill of the present No. 1 cook. a. That present standard soup based on homeopaths admixture of rice and noodles, be replaced by a\ soup primarily composed of fresh vegetables. b. That procurement of adequate substances to carry out the above be initiated and that appropriate culinary instructions be issued accordingly." Washington - Cargo planes were unloading many tons of vital cargo in Cairo within 72 hours after the United States Air Transport Command ordered ammunition to Egypt, Maj. Gen. Harold Lee George, Commander of the Transport Command, revealed here. General George, speaking at the United Nations Club here, said that his Command was operating "what is actually a world-wide air line - one many times larger than the combined air lines before the war." George said that this was needed to transport all the supplies and personnel which have been moved by air to United States forces all over the world. Another responsibility of the Air Transport Command is ferrying aircraft from production lines to flying schools and combat training centers all over the country and to the air forces in Australia, Alaska, England, Africa, India and China. he said that the ferrying division is "larger in flying and ground personnel than the entire Army Air Corps only three or four years ago." FLORIDA IN INDIA Any one of these 10 fellows will tell you that Florida, their home state, is the greatest of the 48. They're all on duty in the same city in middle India. Left to right: Lieut. Henry Chalker, Dunnelon; Sgt. Marshall Cohen, St. Petersburg; Col. Charles H. Caldwell, Tampa; Col. Thomas N. Tappy, Daytona Beach; Lieut. Frank Wright, Gainesville; T/Sgt. Frederick Feeney, Tampa; T/Sgt. William L. Hackney, St. Petersburg; Lieut. Harold E. Welch, St. Petersburg; Capt. David M. Withers, Summerfield; Lieut. James A. Lasseter, Miami. which extend "across the Pacific, to Australia, over the Arctic's ice field to Europe, across the South Atlantic, through Africa's jungles and deserts, and to India and China. Along them there are over 100 great airfields of a size sufficient for the landing and taking off of modern high-speed aircraft . . . Extending the length of each airway, literally covering the entire world, is a highly efficient communication and weather system without which safe and rapid operations would be impossible. With a few exceptions, every flying field in use was constructed before the war began. The youth of this country did the job."